The Treasure Chest Duck braised with abalones and paired with quail’s eggs wowed not only with the flavourful duck but also with the “treasures” flowing out of it as it was cut and served. There were four salted egg yolks, barley, ham and lotus seeds, each contributing delightful textures to the boneless, subtly spiced and fragrant duck. This was a crowning moment in an amazing preview lunch at Noble House in Kuala Lumpur, showcasing the flavours of Nanyang (basically south of China — Malaysia, Singapore and neighbouring countries). The Oriental Group of Restaurants is presenting food from Nanyang in its upcoming 9th Annual Guest Chef Grand Dinner series. Hosting the lunch was Oriental Group Executive Chef Justin Hor with guest Chef Peter Tsang from Hong Kong who is now with Si Chuan Dou Hua in Parkroyal Singapore. 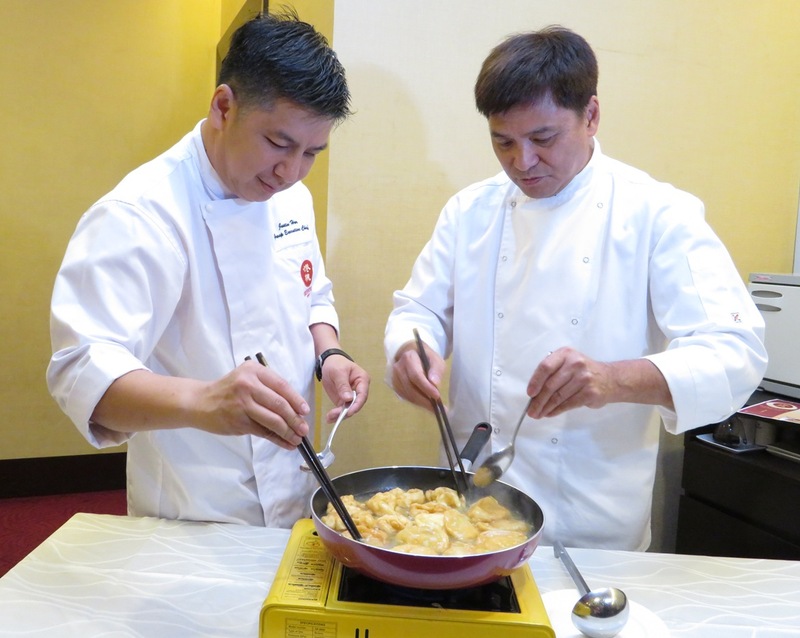 Chef Peter will be presiding over a series of grand dinners at Noble Banquet (Aug 21), The Han Room (Aug 22), Oriental Pavilion (Aug 23), Noble Mansion (Aug 24) and Noble Banquet again (Aug 25). Cantonese cuisine has evolved in the last 30 or 40 years with chefs moving around Malaysia, Singapore and Hong Kong especially. Naturally there has been a crossover of culinary influences. According to Chef Peter, Typhoon Shelter Crabs in Hong Kong came from Nanyang. 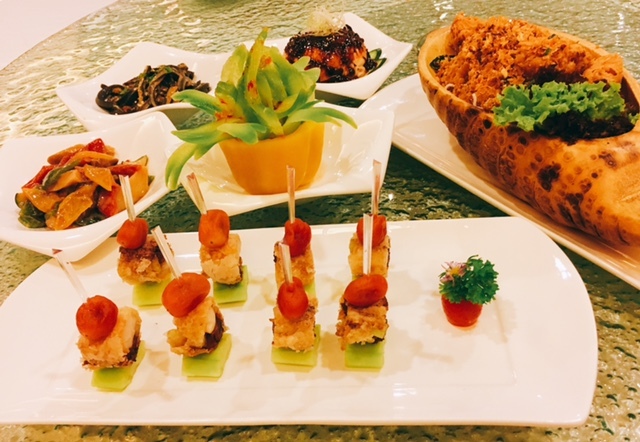 “Hong Kong people now accept Nanyang food,” he said as he introduced dishes in the eight-course Majestic menu, a showcase of the culinary traditions of the Nanyang community here and their ancestors. Tapas Platter of Chilled Chicken in Szechuan Sauce, Chilled Bttergourd in Sweet Chilli Sauce, Black Sesame Noodles, Deepfried Salt & Pepper Sea Cucumber, Liver Sausage & Prawn Roll, Black Sesame Noodles. The Majestic menu (RM1,888 nett per table of 10) is a sumptuous one, beginning with six appetisers. There is also the deluxe Royal menu (RM3,888 nett). The Treasure Chest Duck is from the Majestic menu and also in the a la carte menu at all the Oriental restaurants till Sept 30. Our appetisers were: Capsicum & Apricot Mushroom in Miso, Chilled Bittergourd in Sweet Chilli Sauce, Chilled Chicken with Szechuan Peppercorn Sauce, Liver Sausage & Prawn Roll, Radish Cake Typhoon Shelter Style, Fragrant Black Sesame Flat Noodles. We also had the garlicky Pork Kyuri Roll with Spicy Sauce from the Royal menu, and marvellous Deepfried Salt and Pepper Sea Cucumber. Double-boiled Haruan Soup with Fish Maw served in paper wok. The Black Sesame noodles were silky and superb; the almost creamy radish cake burst with flavour. The Chilled Bittergourd was crunchy, its bitterness tempered with a sweet chilli sauce. Apricot mushroom is the fleshy Eringi which made great bites with its miso and sake marination; I also liked the Chilled Chicken in the spicy sauce. 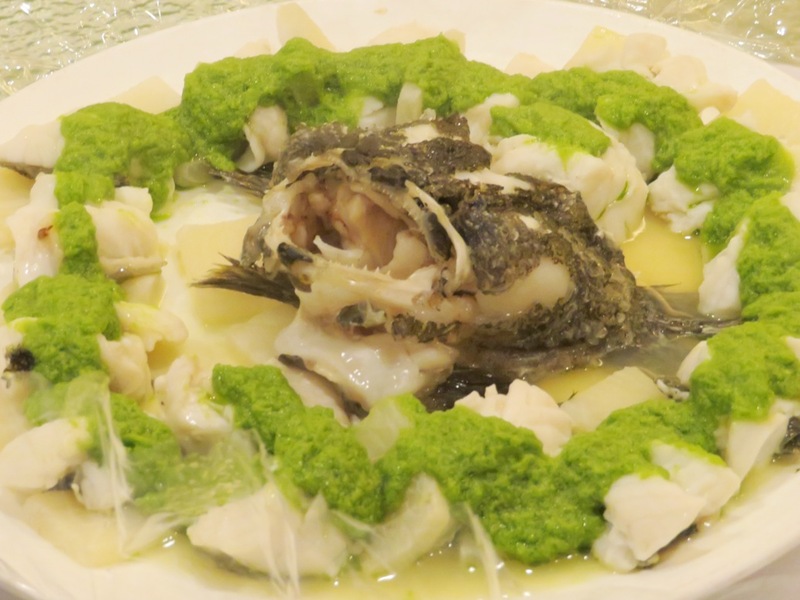 Double-boiled soups are the hallmark of fine Cantonese cuisine; so is a perfectly steamed fish. 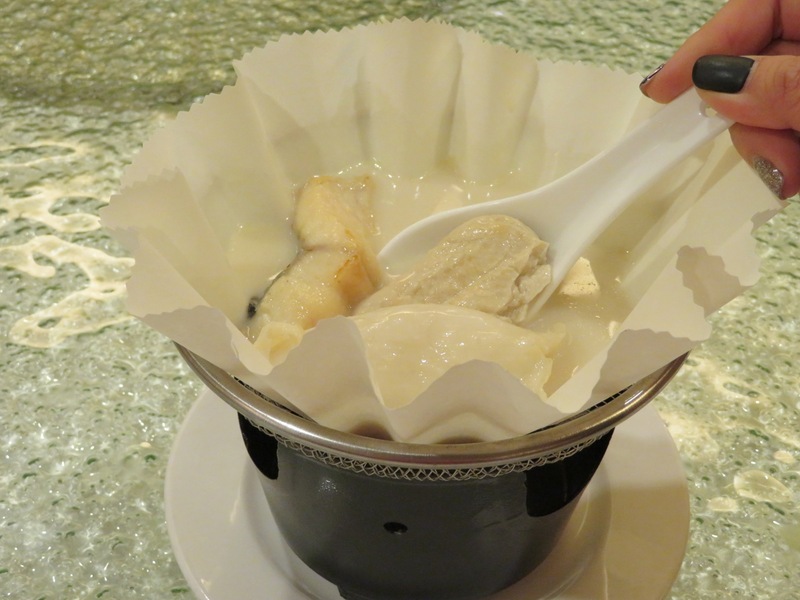 The Double-boiled Haruan Soup with Fish Maw in a Paper Wok stood out, its sweet creamy essence diffused from fish bones that had been fried and double-boiled with peppercorns and old ginger. There was a lovely mouthfeel from the soup, fish maw and a soft spongy tofu that got its texture from being pre-frozen. 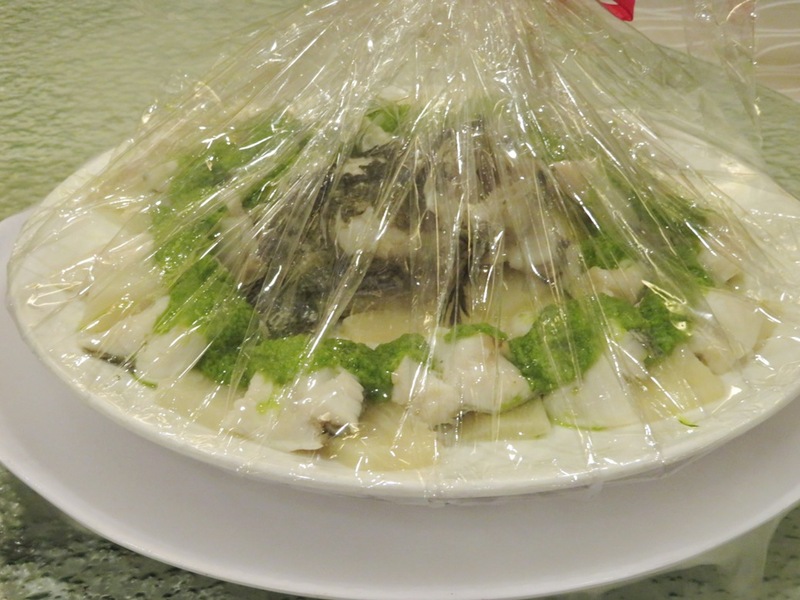 The Crystal-wrapped Steamed Soon Hock with radish and green ginger came out “gift wrapped” in cellophane, and cut open to release stirring aromas from ginger blended with spring onions, sesame oil and shallot oil. And who can fault this fish with its fine meat flaking from the bone, embraced by the hot green ginger, with radish slices drenched in its sauce. Chef Peter got to work with the Scallop in Golden White Souffle, aided by Chef Justin. 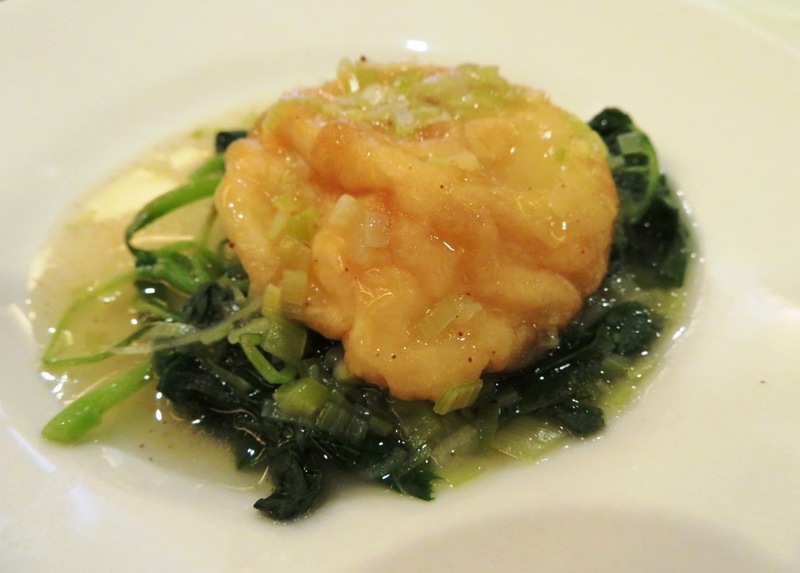 Those delightful soft golden pouches made from egg white were filled with scallop, immersed in superior stock and served on a bed of spinach. They were exquisite. 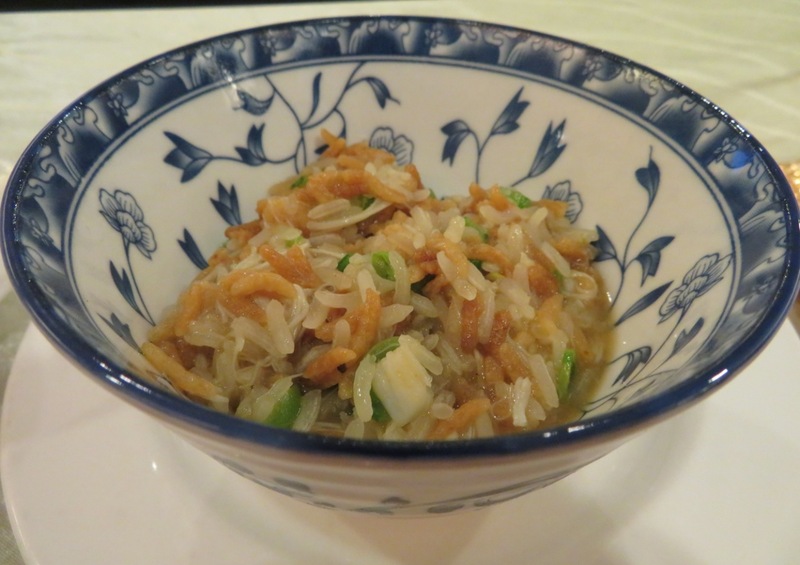 Yin Yang Rice with Lobster and Crabmeat in Superior Crab Soup had Chef Peter sliding glutinous rice into crab stock, together with lobster meat, crabmeat and sweet peas. Fried rice pops were added last, and a delicious aroma popped up. It tasted wonderful. The delicate Chilled Peach Resin in Snow Pear was a fitting finale to the Majestic lunch. 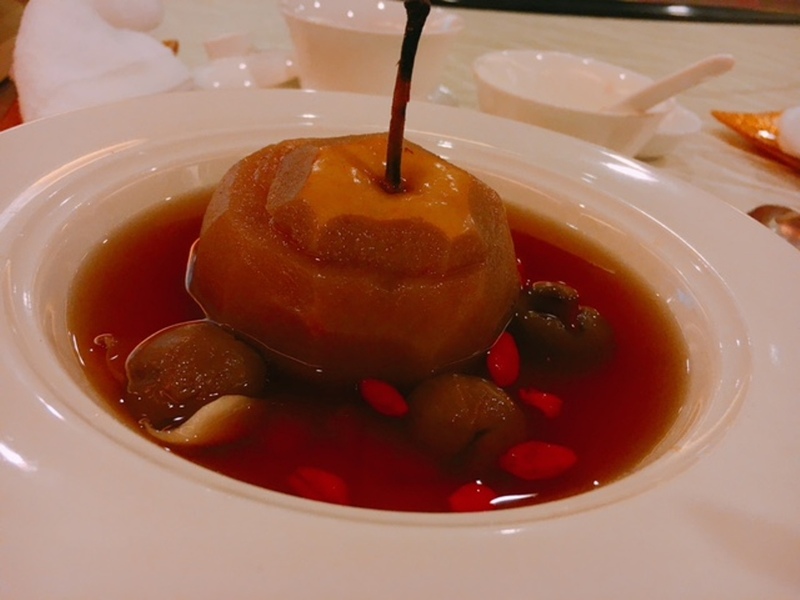 It was filled with bird’s nest and sat in a soup of longan with wolfberries and magnolia petals. On the a la carte menu, the appetisers range from RM18 to RM24 per portion, with RM48 for the sea cucumber. Treasure Chest Duck with abalones is RM388, without abalones RM138. Haruan Soup is RM38 per pax, Scallop in Golden Egg White RM68 for 4 pax. The youthful-looking Chef Peter has 47 years of experience and his culinary offerings are not to be missed.